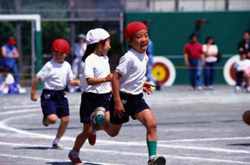 The second Monday of October is Taiiku no Hi, or Sports Day, a national holiday to foster healthy minds and bodies through physical activity. It was established to commemorate the 1964 Olympic Games in Tokyo, which were held from October 10 to 24. It was designated a national holiday two years later in 1966. Until 1999 the holiday was on October 10, but beginning in 2000 it has been changed to the second Monday of the month. Why were the 1964 Games held in October, which is quite late for the Summer Games? The biggest reason was the weather. It had to be just right to accommodate athletes from both warm countries and cold countries. And compared to other cities that had hosted the Games of the Olympiad until then, Tokyo was very rainy. The summer months are hot and humid, moreover, while the weather in spring tends to be very unstable. Early autumn is the height of the typhoon season and is marked by heavy downpours. So the organizers of the Tokyo Games asked meteorologists when would be the best time to hold an outdoor sports event. The answer was mid-October, since by then, the typhoons stop coming, and the skies turn a deep, clear blue. Based on this recommendation, the organizers chose an unusually late date for the Summer Games. Much to the organizers' relief, the Opening Ceremonies were staged under a brilliant, cloudless sky. Since then Sports Day has generally been blessed with fine weather, and a lot of sporting events are held on this day. It's when many elementary and middle schools schedule their field days. At the Kyoiku no Mori Park in Tokyo's Bunkyo Ward, for instance, a lot of athletic events are held each year. Visitors can get a computer-aided check of their physical strength and receive health tips from counselors. A number of ball games are organized, and in the park's square kids can try out the trampoline or go horseback riding.